Here are some facts about the Ancient Roman God, Jupiter. Jupiter is sometimes known as Jove. He is the King of the Gods, God of the Sky and associated with thunderstorms. He wields a thunderbolt and he is often pictured with an eagle at his side. 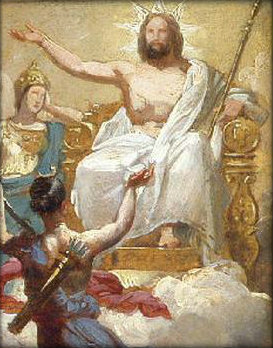 In Roman mythology, Numa Pompilius, the second King of Rome and the successor to Romulus, is persuaded by Jupiter to set out the principles of Roman religion. The oak was Jupiter’s sacred tree. The Romans thought of Jupiter as being equivalent to the Zeus, the Ancient Greek God. As a result, Jupiter is often thought of as the son of Saturn, and the brother of Neptune and Pluto. His children include: Mars, Vulcan and Hercules, and Juno is often said to be his wife. White oxen and lambs were often sacrificed in to appease Jupiter. The oldest temple to Jupiter is situated on the Capitoline Hill in Rome. Jupiter was considered to be the protector of Rome, and he was associated with oaths and treaties. He was worshipped as Jupiter Optimus-Maximus.